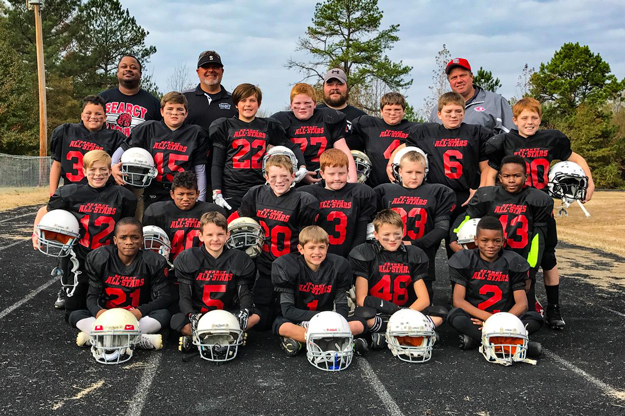 Front row left to right: Trevion Greer, Hudson Green, Lawson Faulkner, Robert Mohr Jr, Justin Ellis, 2nd row: Paten Oxner, Curtis Goodrich, Parker Dabbs, Luke Eubanks, Carson Tucker, JaMarcus Murray, 3rd row: Parker Gardner, Lawson Wimberley, Colin Poore, Zachariah Ellis, Josiah Swindle, Simon Oakes, Cade Cook. The Searcy 4th Grade All Stars recently won the state championship tournament. After experiencing a loss in the first round vs. Jonesboro, Searcy All Stars fought back to win out their remaining games and had the opportunity to face Jonesboro again for the title. Scoring in the last minute of the game, Searcy clinched the state title as time ran out and the defense squelched Jonesboro’s last attempt at scoring. It was a hard fought battle and the team showed tremendous character to bounce back and claim the victory for Searcy.